The WebSampConnector is a client toolkit that enables Web page based astronomy service to interoperate and communicate with VO softwares (no more save and load or cut and paste into the VO world!). It is based on the technology of the middleware previously developed by I. Zolotukhin & I. Chilingarian. Loads a table in VOTable format. Loads a 2-dimensional FITS image. Loads a table in FITS format. Loads a spectrum or SED built by the Simple Spectral Access protocol. Directs attention to a given point on the celestial sphere. Highlights a single row of an identified table by row index. Selects a list of rows of an identified table by row index. The WebSampConnector implements also some of the hub administrative messages to manage the connection of the Web page with the Samp hub. See the documentation for more information about the use of the WebSampConnector. The WebSampConnector project is managed using the Launchpad software collaboration platform. Please report bugs and future requirements on the dedicated pages of the VO-PDC WebSampConnector Launchpad. If you are interested to be involved in the project, register you on the Launchpad Web site and send us a request. To discover the capabilities of the WebSampConnector, test our demonstrator. You will be able to broadcast a VOTable, a FITS image and a SSA spectrum from the Web page to VO softwares. You will also be able to handle events (point at sky, highlight row and a set of rows) between the Web page and the softwares. To run the demo, follow the steps and click on the hyperlink which are proposed. If you do not want to launch all the softwares, run at least one of them and start its internal Samp hub. You will then only be able to discover the capabilities provided by the software. The documentation of the WebSampConnector is composed of a User's guide which detailed how to set up and use it, and of the Javadoc which described in detail the Java methods of the applet. 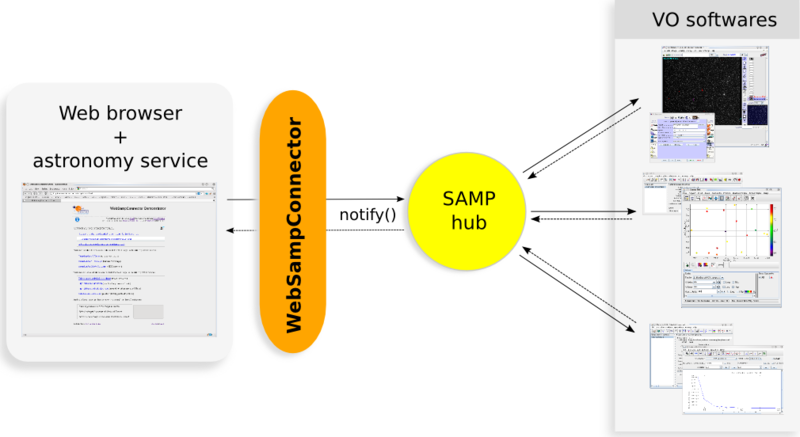 Refer to the SampInfo web page and to the SampStandard web page to get more information about SAMP and its architecture. Go to the SampSoftwares web page to get a list of the softwares which are known to use the SAMP protocol. You can download the WebSampConnector toolkit, demonstrator and sources from this page, or from the VO-PDC portal. The WebSampConnector has been designed and developed by the VO-Paris Data Centre team, in particular by J. Berthier, R. Savalle and J. Normand. We strongly thank I. Chilingarian and I. Zolotukhin for the middleware on which the WebSampConnector is based, and A. Tregoubenko for its valuable help and its huge contribution in the writting of the WebSampConnector code. If the WebSampConnector was helpful for your research work, the following acknowledgment would be appreciated: "This research has made use of VO-Paris Data Centre's WebSampConnector toolkit." This work could not have existed without the IVOA and, in particular, the work of the Applications Working Group. - On some Linux computers using pre-10.50 version, Opera has irresolvable issues with Java (slowness, raised exceptions). - not yet fully validated. More tests are needed. We are still working to fix these issues.